Specifically designed for flat roofs that have one inch or so of standing water. The Roof Sentinel Sump Pump Pan Flashing was designed for property owners with low slope flat roofs that have one inch or so of standing water. Many solar roof pumps have limitations when it comes to the actual bilge pump inside the units. Under normal circumstances it take about an inch and half or more of standing water to initiate the bilge pump into action. On the Sentinel Solar Roof Pump that comes just about to the center of the brass hose bid. Installing the Sump Pump Pan Flashing into the roof will eliminate the issue of the standing water. Many property owners desire no water left on the roof, installing the Sentinel Sump Pump Pan Flashing into the roof will help achieve that goal. Solar roof pump on pan flashing. The Sentinel Sump Pump Pan Flashing should be installed by licensed roofing Professional Contractor. Locate the center or lowest point of the ponding area on the flat roof. The roofing contractor will cut away the roofing membrane and cut into the insulation board. They will then liquid seal the cut away area place the sump pump pan flashing using a flexible heavy duty waterproofing coating and sub seal around the edge of the flashing. Last, your roofing contractor will install new roofing membrane (Modified bitumen, TPO, etc.) and tie into the existing roofing membrane. This will allow the water to drain into the sump area where the Sentinel Sump Pump Flashing was installed. 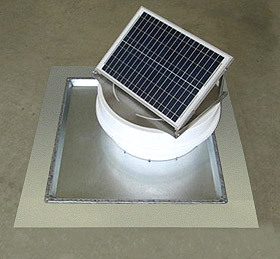 Place your Sentinel Solar Roof Pump in the sump pump-flashing pan. This will allow the pump to be initiated even when there is an inch or so of standing water on the flat roof. 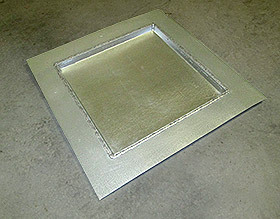 It is very simple for any metal shop to fabricate for $27-$40 each, depending on your location. Click the button below and download the plans for free. Email or fax to your contractor or metal fabrication shop and order your Sentinel Solar Roof Pump and have your roofing contractor install both.